Watch the following video to learn more about our service. You'll see how to login and edit your account. 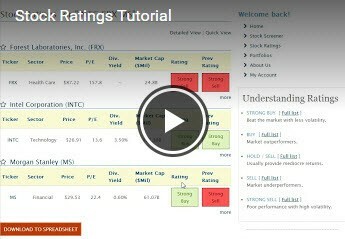 The video also describes briefly the features available on Super Stock Screener: the stock screener, the stock ratings, the stock portfolios and "My Favorite Stock List". 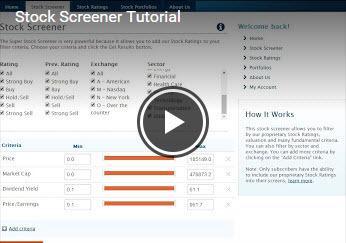 Watch our video tutorials that explain how to use the different sections of Super Stock Screener. Simply click the following link to visit our How To Start playlist on Youtube. 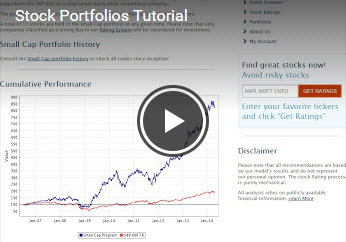 Please send an email to info@superstockscreener.com to request a new tutorial or report on a topic you are struggling with. We would be happy to help. If you do not see emails from Super Stock Screener in your inbox, our emails may have mistakenly been sent to your spam folder. For complete intructions on how to receive our emails with various email providers, please visit the following Email Whitelist Instructions link.